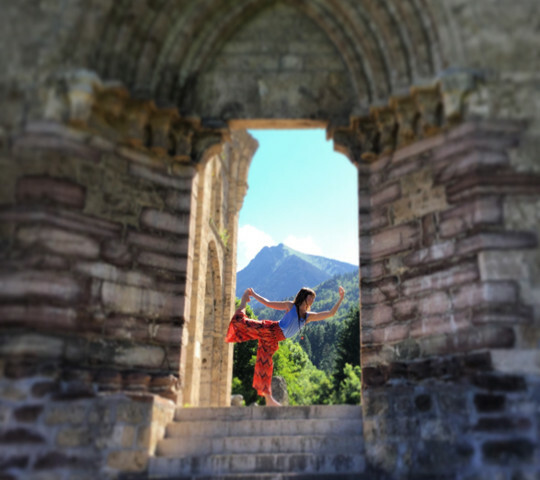 Alpine Action Adventures and Ocean Flow Fitness have joined forces to offer you an energising, health boosting and stress relieving alpine yoga retreat, where you can get away from it all to reconnect with yourself and nature for a long weekend of land and water based activities in the great outdoors. Our yoga instructor Emma is a keen surfer, paddle-boarder and Trekker and loves nothing more than the good vibes and energy that she gets from being at one with nature. Her creative multi-style approach to yoga has a strong Vinyasa flow element to it, along with a focus on core strength, anatomical awareness and alignment and the belief that both yoga and nature can be tools to help you connect with the essence of your true self and to find an empowered and liberated you. Our local guides and Alpine chalet hosts are mountain and fitness loving Simon and Cassie who for several years now have called the area of Morzine in the French Alps their home. With an expert knowledge of the local spots for mountain activities and a keen palate for locally sourced healthy food, we really couldn’t be in better hands. Throughout this diverse weekend experience you will have daily yoga on offer to start and finish your day. Both energising you in the morning and soothing and stretching you out of an evening, all in stunning alpine locations and exciting heritage spots that will feed your soul and ignite your practice. Everyday you will have an exciting range of alpine activities on offer including; A SUP and walking tour of a beautiful local lake and the chance of experimenting with some SUP yoga! Guided mountains and river treks, local sightseeing and some wonderful mindfulness experiences to further connect you with nature and yourself. While we encourage everyone to take part in every fitness activity to really get the best out of your time with us, we can provide alternatives to every exercise we may take on.